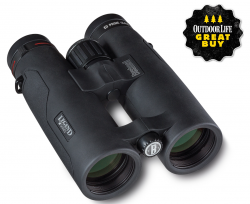 OVERLAND PARK, Kansas – August 27, 2015 – In its 15th annual test of guns and optics, Outdoor Life has bestowed the new Bushnell® Legend M Series full-sized binocular with its coveted Great Buy Award. The test results are included in a feature in the September issue of Outdoor Life that is on newsstands now, as well as online at http://www.outdoorlife.com/features/gun-and-optics-test/binoculars. For the test, a range of mid-size and full-size binoculars were put head-to-head under a variety of conditions and judged on brightness, clarity and color reproduction. The testing staff commented that the Legend M Series binocular stood out in value and image quality, earning the Great Buy Award. The team loved the binocular’s ergonomic design, oversized focus wheel, open-bridge construction and fully coated surfaces, which enhanced light transmission and color. The Legend M Series is a new addition for this year that takes the Legend line to a whole new level with maximum brightness and clarity. Constructed on a lightweight, open-bridge magnesium chassis, these high-end 8x and 10x optics have 42mm objectives and provide 92 percent light transmission through the entire optical system by using the very best dielectric prism coating. This coating reflects more than 99 percent of incoming light to allow for maximum light output at dusk and dawn. To push this technology to its highest level, Bushnell has paired it with ED Prime extra-low dispersion fluorite glass that brings out detail under low light, provides improved color resolution and contrast and practically eliminates chromatic aberration and color-fringing. Add in the all-weather assurance of Bushnell’s exclusive RainGuard® HD water-repellent lens coating, improved eyecup resistance and a locking diopter, and the Legend M sets a new standard for maximum brightness, clarity and performance in the field.